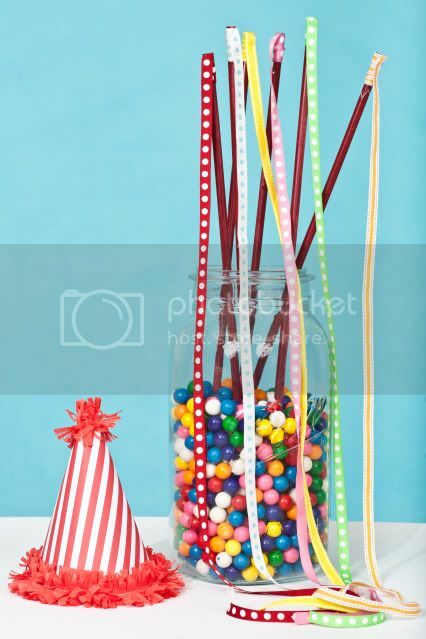 Kara's Party Ideas | Kids Birthday Party Themes: DIY Tutorial: Make Your Own Bubble Gum Machine! Kara's Party Ideas | Kids Birthday Party Themes: DIY Tutorial: Make Your Own Bubble Gum Machine! DIY Tutorial: Make Your Own Bubble Gum Machine! 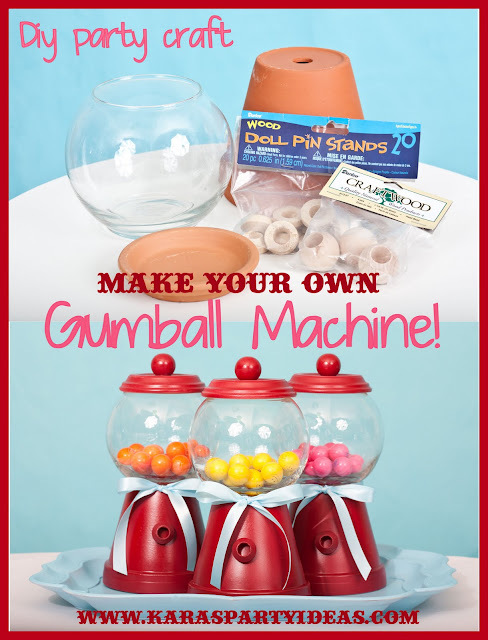 make your own gumball machine! These go with the Gumball Party I styled for HGTV here. Photo's taken by Lyndsey Fagerlund. 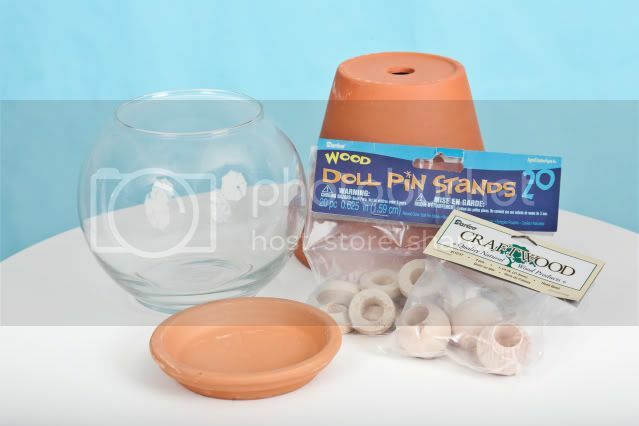 STEP ONE: Paint your terra cotta pot & base, your round wooden ball and your doll pin stand with the spray paint and let dry. STEP TWO: Place terra cotta pot upside down and apply glue to the bottom. Then attach the round bubble bowl to resemble a gumball machine. STEP THREE: Turn the terra cotta saucer base upside down and glue the round wooden head bead to the center top and let dry. STEP FOUR: Attach the wooden doll pin stand to the front of the terra cotta pot to resemble an opening. YOU HAVE A GUMBALL MACHINE! These would also make fun cookie jars! Again, to see the rest of this Bubble Gum Party go here! Thank you for that! That's great! So easy! Love the tutorial! Thank you! What a fabulous idea! It is so simple. Thanks for sharing! LOVE it! I'm totally going to have to try this out. Such a fantastic, easy, creative idea! So great i just had to 'Pin it' on Pinterest! So creative! LOVE IT! This is my all time favorite party site....and I MEAN IT! THANK YOU! 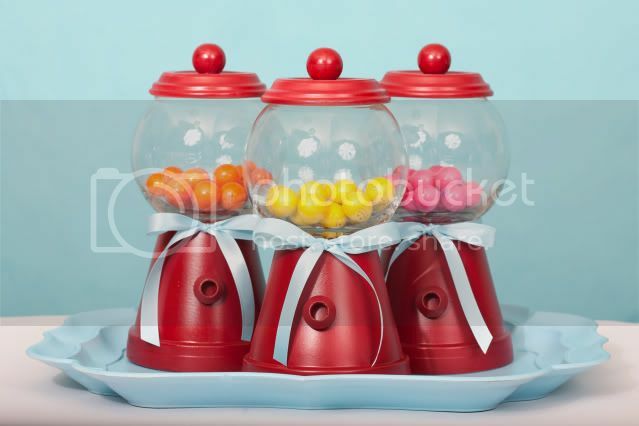 This is perfect timing...I am doing a sweet shoppe theme for my daughter's 1st bday and these would be adorable to use. The best ideas are always the simplest. This is amazing! impressive - I wouldn't have guessed it was from those basic materials! Thaaaaaaaaaaank Youuuuuuu for your brilliant idea!!! I LOVE IT!!! thanks for the idea i went to walmart and found a big clay pot for 3.00 and found the big bowl at goodwill for 2.00. the machine turned outn to be a big hit a my party. thanks!!!!!! What size terra cotta pot did you use?